Trouble in Spanish Waters ! Sunday, November 8th, we woke up with really loud music at 6.45 AM coming from the boardwalk. Apparently there was a sport happening which started early ! Luckily after an hour the music died, we had an early start on our sunday. 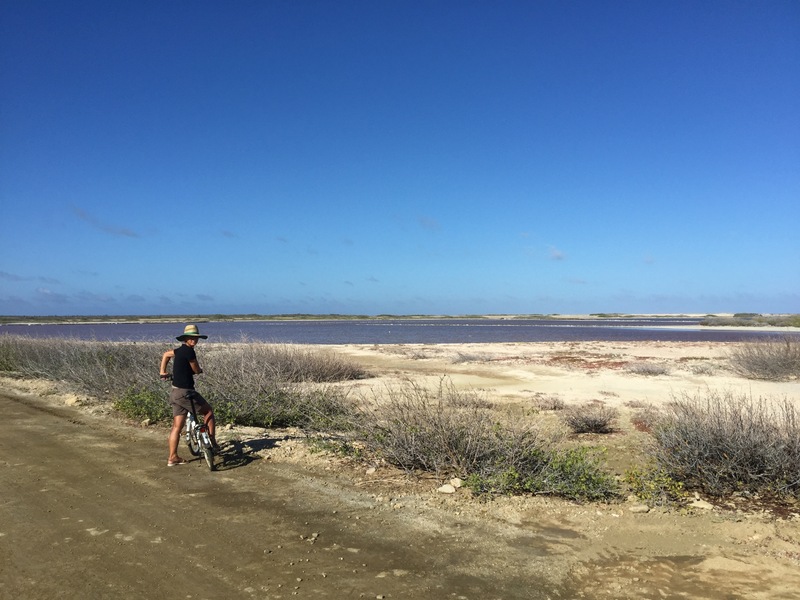 We had decided that on our last day in Bonaire we would go to Lac Bay, a nice beach. We left around 10 AM with our bicycles, our e-readers and beach gear. It was an hour ride against the wind. But we enjoyed the scenery. On the way to Lac Bay. The beach at Lac Bay ! Perfect atmosphere at the beach restaurant ! When we got there we immediately checked with the little bar if we needed to make reservations for the food. We were early and could pick out a nice spot on the beach. The colour of the water was intense blue and two pelicans were looking for some fish. There was a nice breeze, clouds and sun, the water temperature was 28 Celsius, I finished a new book, Het kleine meisje van Meneer Lin from Philippe Claudel. A short nice story, I enjoyed it. Definitely recommended for a short reading. 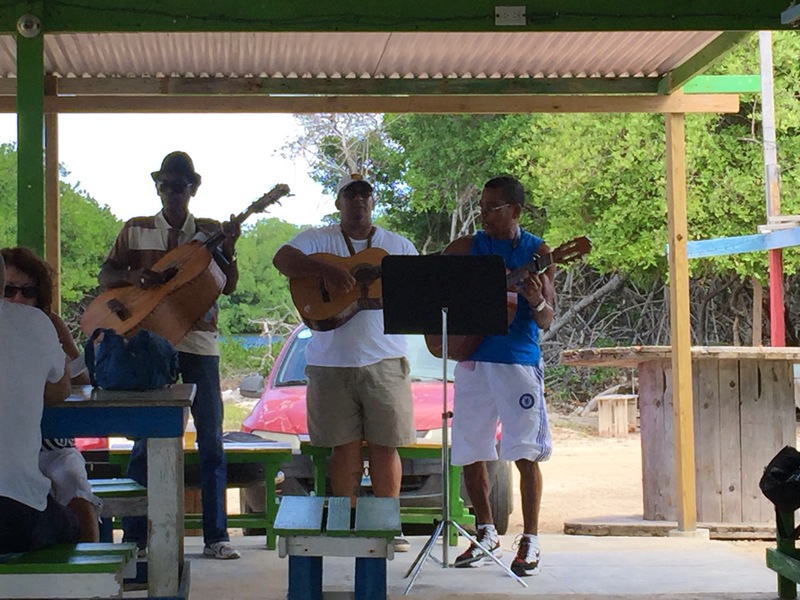 We had fried fish with corn pudding and rice for lunch and there was a band with guitar singing in spanish, the restaurant was packed. The atmosphere was really great ! We swam, fell asleep and went back home at 4 PM to arrive at the boat just in time for a shower and a cocktail at sunset 🙂 . What a great way to end our time in Bonaire. Monday, November 9th, Stefan checked out at the marina and at immigration so we could leave around noon to Little Curacao about 28 NM. The weather was nice, lots of wind and sun. We managed to get there at 3.30 PM, did a little faster than 7 KTS with winds of 20-25 KTS, great sailing ! When we arrived there was one tourist boat who just left and then we were alone…again incredibly blue-greenish water. 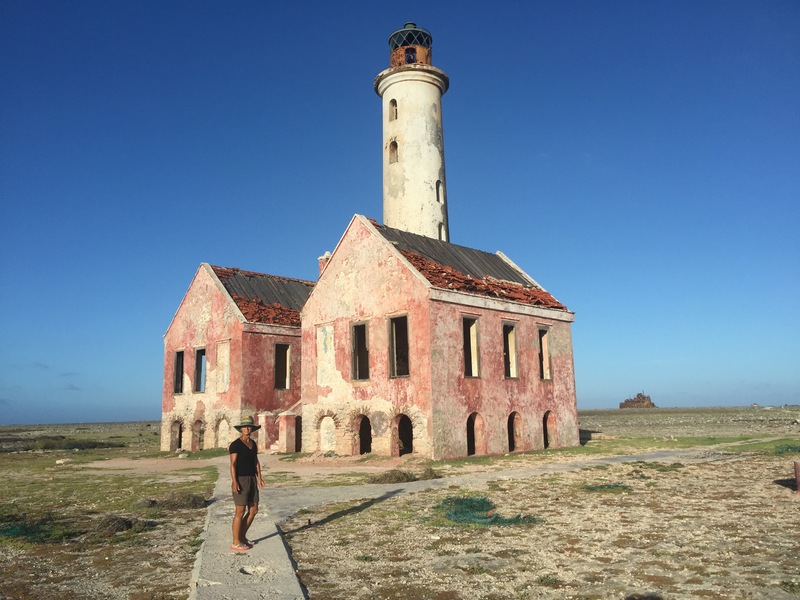 A deserted lighthouse, a ship wreck and two closed bars was all there was to see. We enjoyed the peace and quiet. 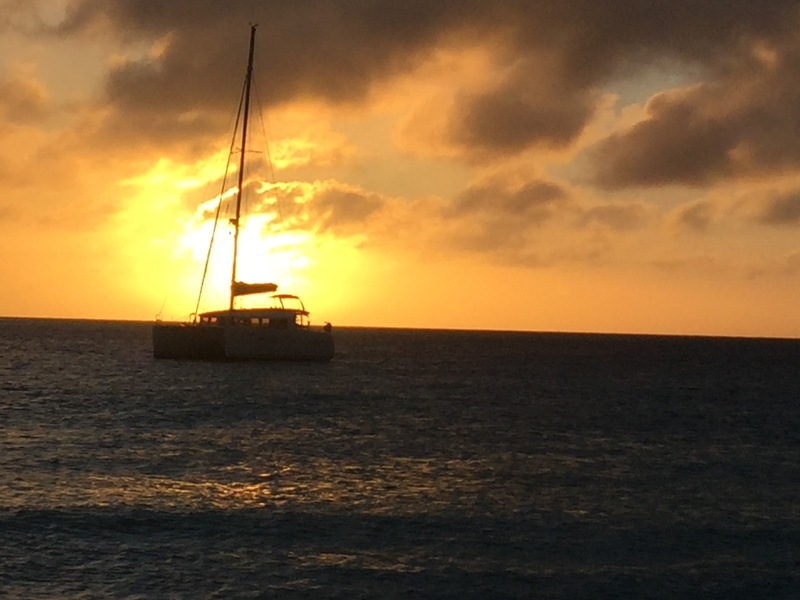 Around 6 PM our neighbours from Bonaire arrived (Italians) and at 9 PM another boat anchored in the dark. The anchorage was rolly but it did not bother us. 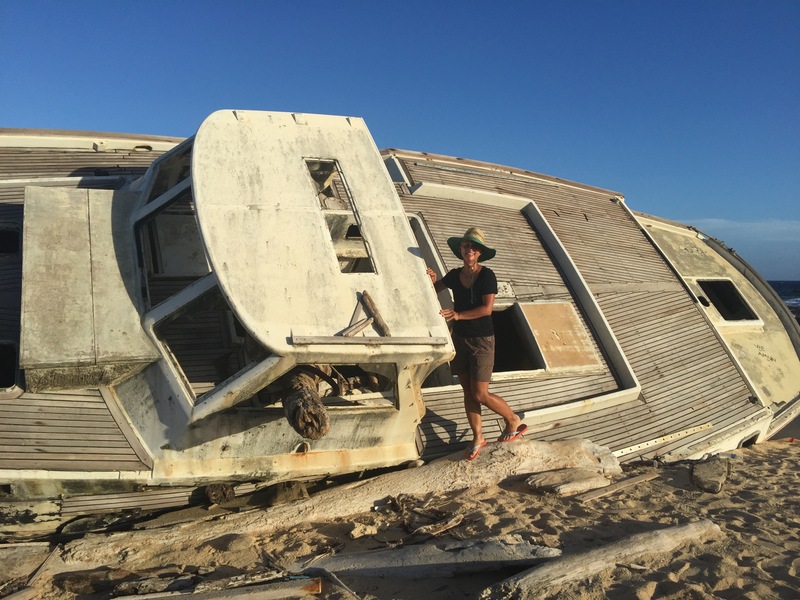 Hopefully we can avoid this ….shipwreck on Klein Curacao. Deserted lighthouse on Klein Curacao. Sanuk in the sunset on Klein Curacao. 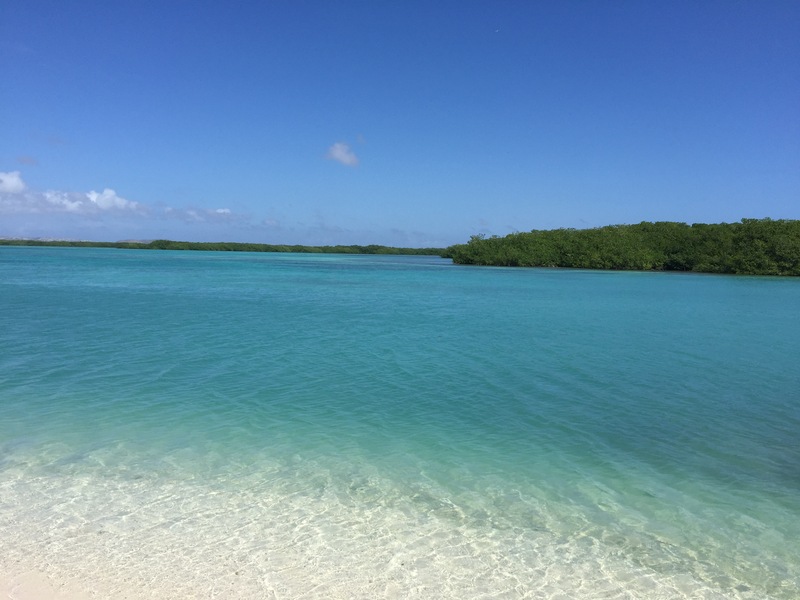 Tuesday, November 10th, we went snorkelling in the morning to see the turtles but did not see any..it was only when we were back on the boat that we saw 5 turtles swimming around the boat ! It was a nice anchorage but we wanted to go to Curacao. We left at 2 PM and arrived two hours later in Fuik Baai, we were the only sail boat. There were some small motor boats fishing and enjoying the bay but they all left at 5 PM. All alone again 🙂 We watched 3 episodes from The Americans (3rd season) outside on the terrace with a cup of tea and speculoos under a beautiful starry sky. Life is beautiful ! We are anchored in zone A, top right corner. During the night we were anchored outside the A-zone, on the “K’ from ‘dock’…You can see why I wanted to move as soon as it was daylight ! used by most cruisers. We got there in less than 1 hour, since it was so short we only got the genoa out and motored. The entrance was not easy to see but we managed well. Only when we got there it was full with boats… I got nervous already because the anchorage space is well defined and with a wind of 20KTS you need enough chain so enough room to anchor. We found a good spot and anchored in two times so I was happy. After anchoring we stayed a couple hours on the boat before going to shore. Stefan checked the anchor but could not see anything because the water was too muddy. There was one other boat with the Belgian flag ! We went ashore to check out if we could use our bicycles, got our emails, whatsapped with family and got a drink. When we returned we were not sure if our boat did not move…The boat in front of us “Panache” swinged a lot on his anchor and we had a hard time to decide. At 6.30 PM, chicken was just in the oven, Stefan was sure the anchor was dragging ! There was just a little light when we decided to re-anchor…Picking up the anchor when it has dragged is not as easy as thought because with all those boats around there are a lot of anchors around too ! At one moment, we got so close to Panache that we were going to hit the boat….Stefan kept his cool and got out the fender and I a second one so we could avoid any damage, our anchor had dragged under their boat ! Immediately there were three other cruisers helping us recovering the anchor, Belgians and Dutch. By then it was dark and we had to find a better spot and re-anchor…we decided not to go all around the anchorage and look for a better spot but we anchored a little further from our first spot with the disadvantage that we were in the channel ! Needless to say we both did not have a good night sleep. We set our alarm every 3 hours to check and I ended up checking every 2 hours. We did not move 🙂 but we clearly had to move the boat as soon as it was daylight and boat traffic would pick up ! Thursday, November 12th, at 6 AM I said to Stefan lets move the boat! At 7 AM we had picked up the anchor and had plotted the GPS coordinates from the anchorage in our Raymarine plotter. We took our time and went all around the other side where we found a perfect spot ! Lots of room and close to a dinghy dock. At 8 AM we enjoyed our breakfast in our new spot in 4 meter water and with 40 meter chain! We stayed on the boat all morning to make sure he did not move. At noon we decided it was time to go to Willemstad and officially check-in. The bicycle ride was further than we thought . No bike path and lots of traffic. 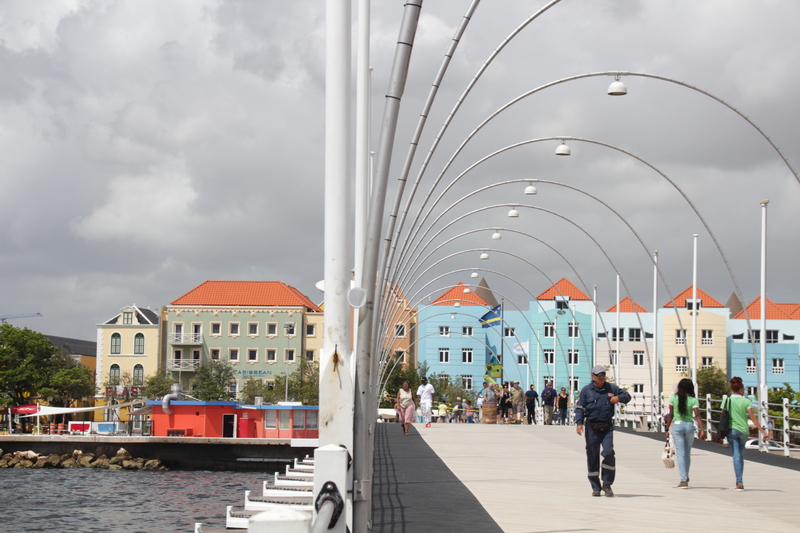 When we finally got in Willemstad we could not find the immigration and customs office….We asked around but did not get the right directions…Just when we were about to return to the boat and give up we found the immigration office 🙂 . In 20 minutes we had our stamps and were checked in, now get our anchor permit and go to customs to clear in. We could not get our anchor permit without first clearing into customs, which was located on the other side of the river…At customs we had a very slow custom official and it took her 45 minutes to clear us in. Stefan stayed very calm and answered all her questions politely 🙂 . It was 4 PM when we sat down at the Iguana cafe, got lunch and checked our mails ! We arrived back at the boat just before sunset and the boat did not move ! 🙂 I slept like a rose. 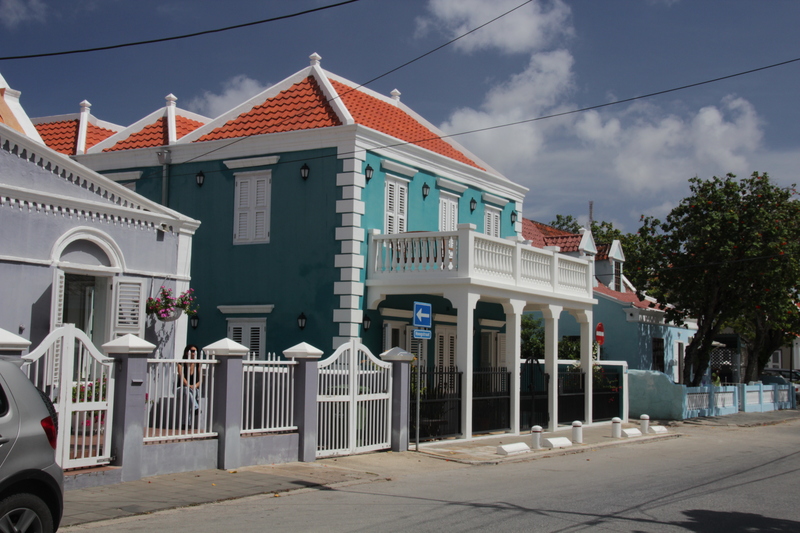 Willemstad (Unesco Heritage), more pictures to follow. 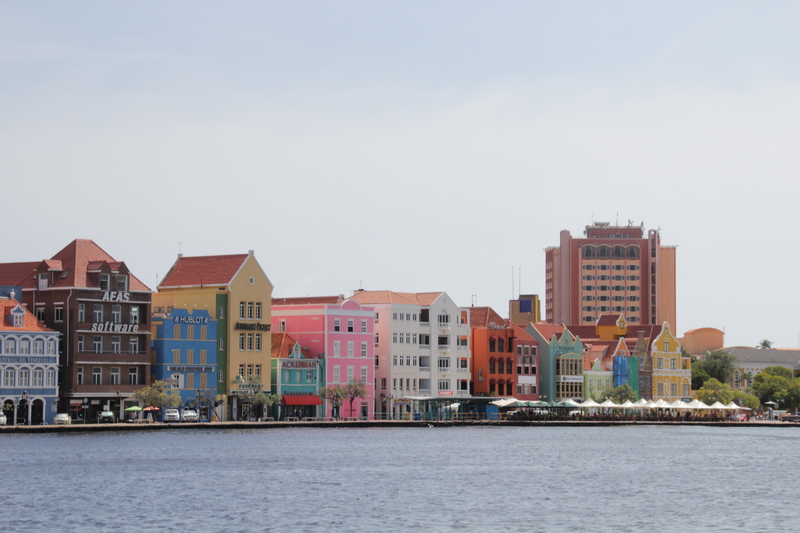 Willemstad, more pictures to follow on our next visit. Queen Emma, pontoon bridge over St.Anna bay. 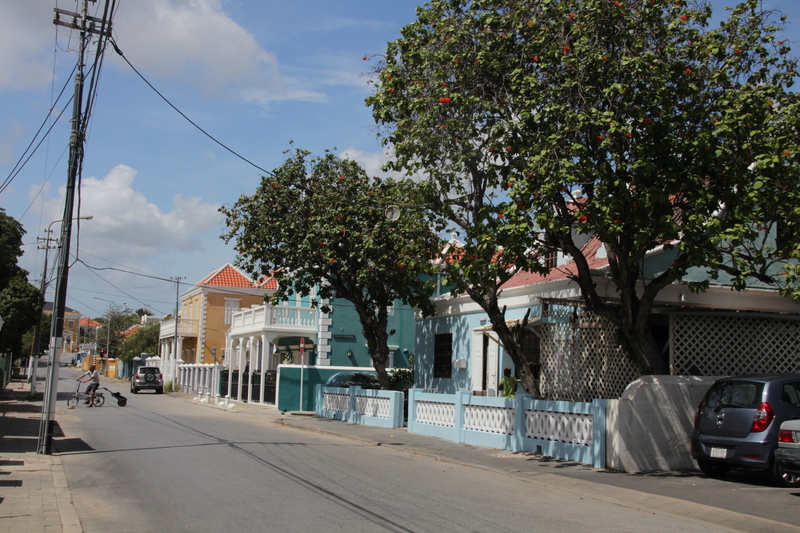 Lost in the streets of Willemstad, but beautiful colonial houses. Streets in Willenstad, looking for immigration.